Sanitary : Parry ware/ Neycer/ Hind ware (white in colour). 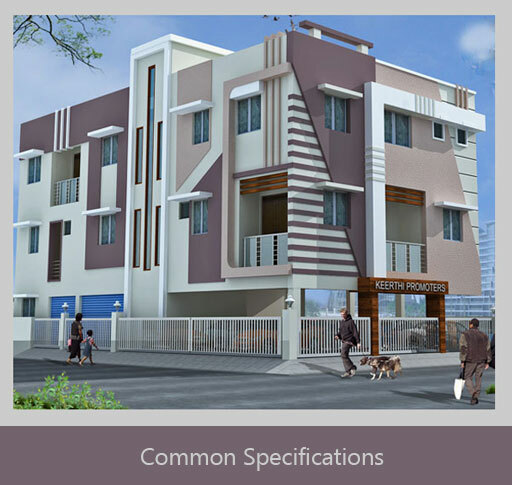 Special Amenities as per Individual requirements at extra cost. Promoters reserve the right to make alteration as may be necessary without notice. Registration charges, Deposits of MES, Metro water and Drainage will be paid when due. Sale Tax contingency and any other deposits to be paid to the government authorities as possible will be extra. Any additions and alterations required by the PURCHASER/PURCHASERS without affecting the structured stability and elegancy of the building may be provided at additional cost which shall be payable in advance and Handing over of the flat Subject to the clearance final payment after issuing the No Due Certificate only.